These are so delicious. Like a lot of people I’m hesitant about using protein powders because most of them contain so many processed ingredients and additives but if you use a good quality, plant based one (Sunwarrior and Nuzest are my favourites) then they can be a delicious and really nutritious addition to smoothies and treats like these. 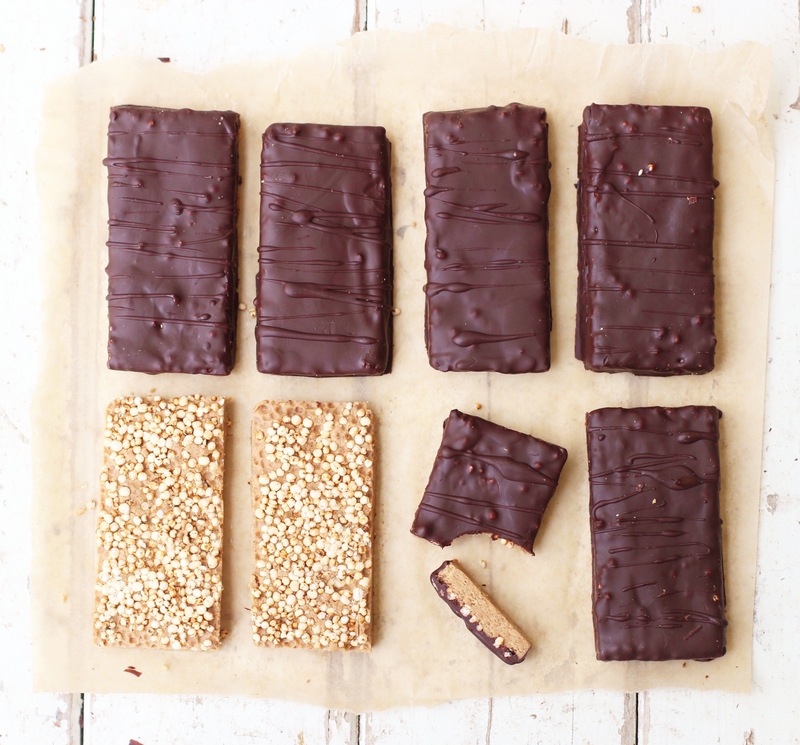 These bars have a fudgey, slightly crumbly filling with a satisfying crunch from the toasted quinoa pops and, of course, I couldn’t resist coating them in some rich dark chocolate. Add the quinoa pops to a baking tray and pop them in the oven at 180’C for about 5 minutes, just until crisp. Set them aside. d the protein, almond butter, maple syrup and 90ml of nut milk to your food processor and blend on high until well combined. Drizzle in any extra nut milk gradually while blending, depending on the type of protein you are using you will need different amounts- you should have a crumbly paste that’s kind of squishy when you squeeze it. You don’t want it to be wet so add it gradually. Line a small baking tin with parchment paper and press the mixture really firmly into it. Sprinkle the quinoa pops evenly on top and then press them into the base. Use your palm and the back of a spoon to really, really press them in so that the top is as smooth as possible for the chocolate layer. You can shake off a few of the excess quinoa pops that won’t stick in. Pop the tray in the freezer for an hour. Slowly melt the chocolate and coconut oil and whisk together until smooth. 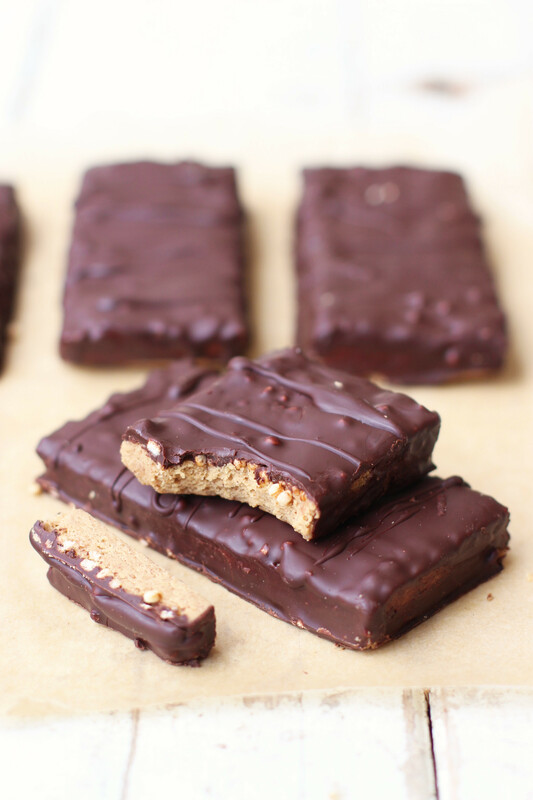 Take the tray out of the freezer and slice into bars. Dip each one in the dark chocolate to coat and then pop them in the fridge to set. Hiya..im just wondering where do you buy your protein powder..?.I find it very hard to get gluten and dairy free and dose that I find have alot of additives in them? just wondering… what do you think about subbing the quinoa pops for brown rice cereal? yes? would I not need to toast then? ps these look amazing!! Where can I get quinoa pops? Is it different to ordinary quinoa? Thanks so much Claire im a calorie counter so was wondering how much they would equal to. Hi Indy, I’ve a preference to using roasted nuts instead of the quinoa pops/puffed rice, which nuts would you advise and what’s the procedure in using them. Thank you.